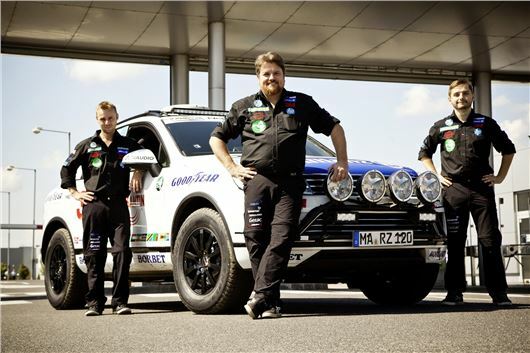 Starting on Sunday 21st September, Rainer Zietlow, Marius Biela and Matthias Prillwitz are to challenge the record time from North Cape, Norway to Cape Agulhas, South Africa in a Volkswagen Touareg V6 TDI. The route is over 10,600 miles long passing through the countries of Norway, Finland, Sweden, Denmark, Germany, the Czech Republic, Slovakia, Hungary, Serbia, Bulgaria, Turkey, Egypt, Sudan, Ethiopia, Kenya, Tanzania, Zambia, Zimbabwe and South Africa and is a surprising 97% paved. Nevertheless, awaiting the adventurers are deep potholes in Sudan and Ethiopia, countless switchbacks in the African highlands and the infamous "Road of Hell" peak with its corrugated and volcanic rock surfaces in northern Kenya. Temperatures range from freezing in Norway to 48 degrees Celsius in Sudan. The team has been preparing for the project for more than a year, including a scouting tour in the opposite direction that Rainer Zietlow and Marius Biela drove in June. This tour served to define all critical points and to map the entire route with GPS data. During the record-breaking marathon, the team will drive around the clock in a three-shift system that will only be interrupted for diesel refuelling stops, meals and the usual formalities at country borders. Team leader Rainer Zietlow will be accompanied by Marius Biela, a photographer and video productions specialist, and Matthias Prillwitz, an experienced participant of Rally Germany. Their vehicle is the new Volkswagen Touareg V6 TDI, which is essentially a standard production car. The only modifications made for this ultimate endurance test were to add a rollover cage and two auxiliary fuel tanks for a driving range of over 3,000 kilometres per fuel stop. During the record drive, the team will post daily reports on their experiences at the website www.touareg-capetocape.com, and a blog will provide information about each day's stage with photos and a brief video. The current position of the Touareg will also be shown on a virtual map that is updated every five minutes. A free app developed by Hewlett Packard (HP CapetoCape) will show the latest data from the Touareg such as acceleration, braking behaviour and even suspension damper displacement in real time. Off-road enthusiast Rainer Zietlow began his numerous global tours in 2005. On his adventures, he set two world records in 2011 and 2012: The "Panamerican" from Tierra del Fuego to Alaska in 11 days and 17 hours, and the "Russtralia" from Melbourne to St. Petersburg in 17 days and 18 hours. The photo shows left to right: Matthias Prillwitz, Rainer Zietlow, Marius Biela.